August | 2013 | Crystal Water Villas Blog - Lake of the Ozarks! If you’re spending your Labor Day weekend at the Lake of the Ozarks, there will be no shortage of warmth and sunshine. Perfect for renting a boat, exploring a local cave, or barreling down some of the best water slides in the country! 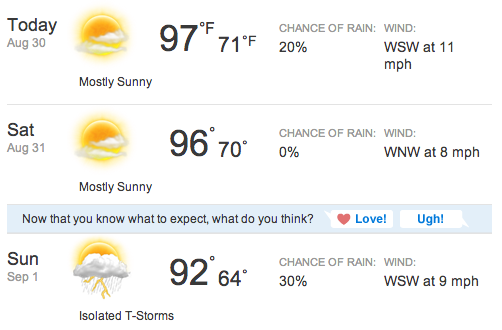 Stay hydrated: With temperatures in the upper 90’s, be sure to have a cooler full of ice and bottled water. The heat can sneak up on you if you’re not careful! Wear Sunscreen: There’s nothing worse than spending your vacation fried from a bad sunburn. Apply sunscreen at least every few hours. Do your best to find some shade every now and then, whether a canopy on a boat or relaxing under some trees. Mix It Up: It’s always nice to balance out your trip: Spent a good amount of time on the lake, enjoying the outdoors, then head indoors for some air conditioning in the evening. Don’t miss out on the fabulous fireworks displays this Sunday. Here’s also another roundup of weekend activities. We hope everyone has a safe, relaxing, and happy Labor Day Weekend! Make the last days of summer count! Don’t miss out on one last fireworks hurrah at the Lake of the Ozarks! Here are four spots to watch fireworks on Sunday, September 1st. The fireworks begin at dusk. As always — if you’re staying with us over the Labor Day weekend holiday, be sure check out our Lake of the Ozarks Local Area Guide for activities for couples, a women’s weekend, or fun for the entire family. As summer comes to an end and kids return to school, there’s still plenty to look forward to at the Lake of the Ozarks! Fall is one of the most beautiful times of the year at the lake and there’s no shortage of events. The Lake of the Ozarks Convention & Visitor Bureau has a comprehensive listing of events at the lake in September. It all begins with fireworks over Labor Day weekend and ends with the 28th Annual Turkey Festival on September 28th. 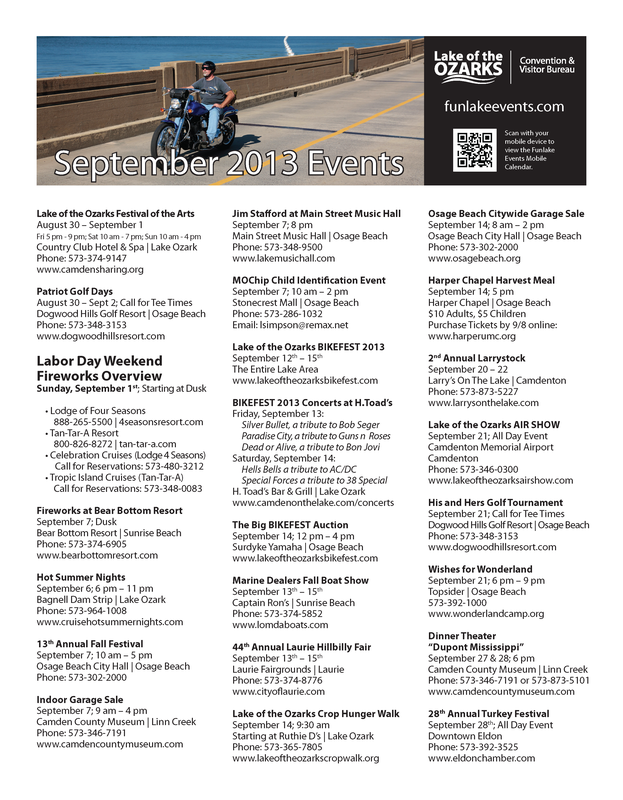 Click here to see the all of the events happening in September. Hollywood tends to give all the credit to the newest film technology, especially with all of the new 3-D movies coming out. But sometimes it’s the classics. The old times films that capture our hearts and our imagination. The Lake Online tipped us off to a gem in nearby Stover, Missouri — The Osage Theater. If you’re tired of the summer heat and are looking to relax for a bit, watching an old film is just the ticket. Every week offers something different. Friday is western night where you might see a film with Roy Rogers or The Lone Ranger. On Saturday’s classic comedies with Carry Grant and Gene Arthur might be shown. Showtimes are Friday and Saturday at 7 p.m. Admission is $2. A small concession stand is available. This restored theater was brought back to life by owners Joseph and Susan Ryan. The theater was built in the 1920s and was used as a theater from the 1940s until the 1970s. The lineup always changes, but they show everything from classic comedies, old cartoons, and even a Western night every Friday. The Osage Theater is located at 308 West Second Street, Stover, Missouri. It’s 2 blocks South of Hwy. 52, a 35- minute drive from Eldon. For more information, call 573-377-2136. The Lake of the Ozarks Shootout kicks off this Friday, August 16th and ends on August 25th. This is the 25th anniversary of the Shootout and is expected to bring in a crowd of 100,000 spectators to the lake. According to Fox KRBK-TV, The Shootout “is the largest unsanctioned boat race in the United States”. We decided to put together some helpful links so you don’t miss a thing! With us, of course! Check out our properties here.